period 540 million years ago. Many palaeontologists believe only multi-celled organisms could have made these tracks. This has been difficult to confirm as no multi-cellular fossils of such an age have ever been found. The discovery was made by marine biologists monitoring the sea bed in the Bahamas. They noticed a great deal of tracks made by grape-shaped creatures called protists. Dr Mikhail “Misha” Matz from the University of Texas at Austin, US, led the research. “We were looking for pretty animals that have eyes, are coloured, or glow in the dark; instead, the most interesting find was the organism that was blind, brainless, and completely covered in mud,” he said. The researchers say the 3cm-wide, single-celled protists propel themselves using tiny protruding legs called pseudopodia. A number of openings all over the body act as mouths and outlets for waste. The protists move very slowly, taking weeks or even months to make a track of a few centimetres. As the sea bed currents where they were observed are very slight, their tracks are not washed away. The protist tracks look very similar to fossil tracks found in the pre-Cambrian era more than 500 million years ago. Perhaps the most famous are the “worm casts” found in the Stirling Ranges in Western Australia. In 2002, these were dated to at least 1.2 billion years old. This dating presented a problem for palaeontologists; they assumed multi-cellular organisms with bilateral symmetry, where two halves of their bodies are approximate mirror images of each other, had to be responsible for such tracks, but there is no fossil evidence for the existence of such creatures until several million years later. Fossil experts believe bilateral symmetry is what gave the organism the ability to make the tracks, with the impressions being produced when the organism moved its weight from one side to another. Dr Matz believes protists provide an explanation of how the tracks could have been made without the need for organisms with bilateral symmetry. “We used to think that it takes bilateral symmetry to move in one direction across the seafloor and thereby leave a track,” he explains. Bilateral symmetry appeared in the Cambrian era about about 542 million years ago, early creatures quickly diversified into all of the major animal groups of today. Quite how or why this rapid diversification, known as the Cambrian explosion, occurred is still one of the biggest questions in animal evolution. Very few fossils exist of organisms that could be the pre-Cambrian ancestors of bilateral animals, and even those are highly controversial. 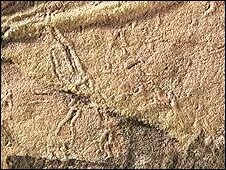 Fossil traces, such as these tracks are the most accepted evidence of the existence of these proto-animals. 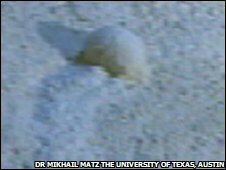 Dr Matz says all tracks which predate the rapid evolution of life seen in the Cambrian explosion – could come from protists. “Pretty much anything within the Precambrian fossil record can in principle be attributed to large protozoans, from the earliest traces and fossils of the Stirling formation,” he says. 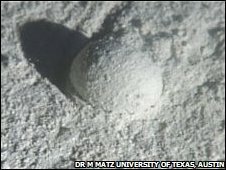 The researchers say forms described as “globular or bulbous collapsible bodies” which were found fossilised together with the Stirling formation’s worm trails are probably the remains of creatures very similar to the protists they found at the bottom of the sea. Genetic analysis shows this moving protist from the Bahamas is broadly the same as a stationary type found in the Arabian sea. The researchers are now beginning a project which they call “deep-sea palaeontology” to create a catalogue of tracks produced by a variety of present-day underwater animals for comparison with the fossil record. Dr Matz says the giant protists’ bubble-like structure is probably one of the planet’s oldest body designs, and may have existed for 1.8 billion years. “Our guys may be the ultimate living fossils of the macroscopic world,” he says.